Memorial Sketch of Hyde Park, Mass., for the first twenty years of its corporate existence (1868 – 1888) By Jos. 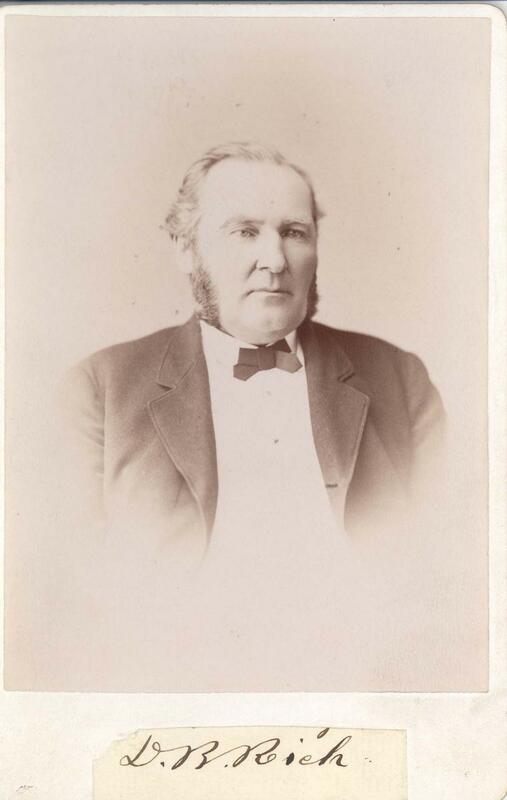 King Knight, D.D.S., Edmund Davis, Esq., Henry B. Humphrey. 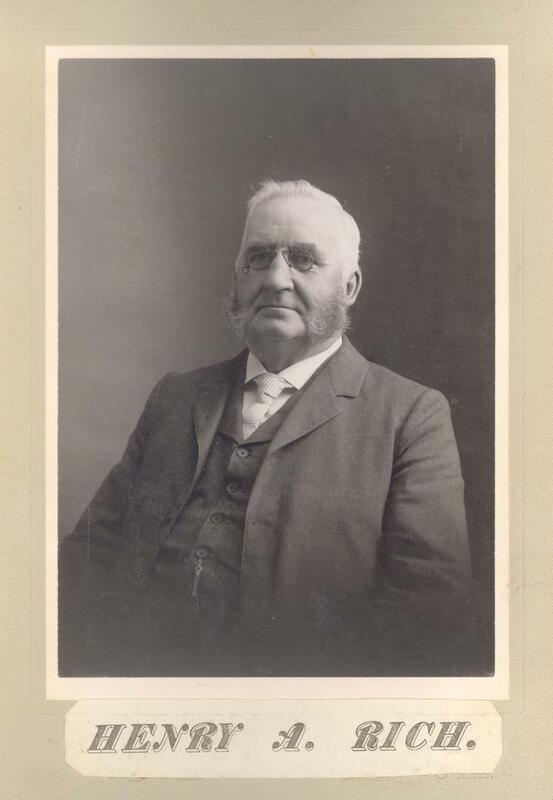 The following article includes edited extracts from an address delivered at the first annual banquet of the town officers of Hyde Park, March 9, 1872, by the venerable Henry Grew, one of the town’s oldest as well as most esteemed citizens. Also Sumner’s mills and a few small tenements occupied by their operatives, and a small schoolhouse near the same. ” These were the only settlements in Dorchester. 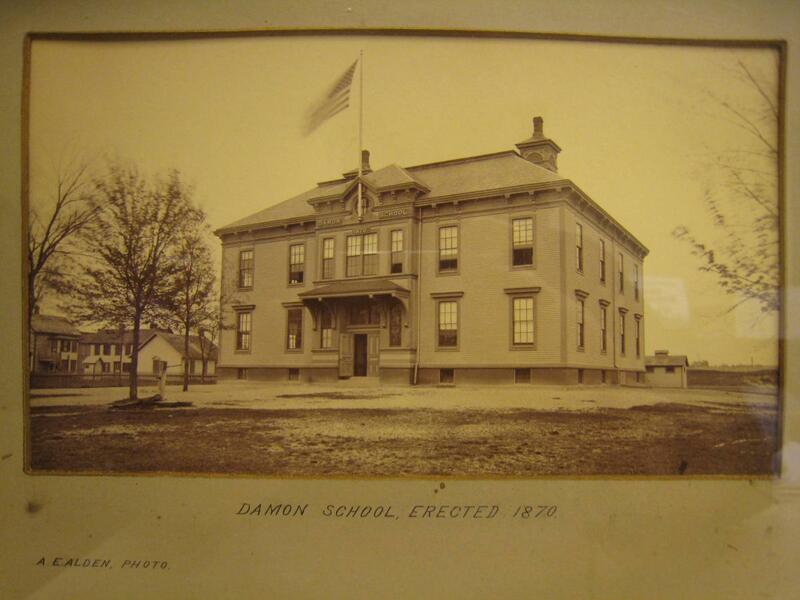 On the easterly side of the Neponset River, which was the boundary line between Dorchester and Milton (now Fairmount) all was woodland and pasture, the first settlement in that part of our town having commenced in 1855 or 1856. 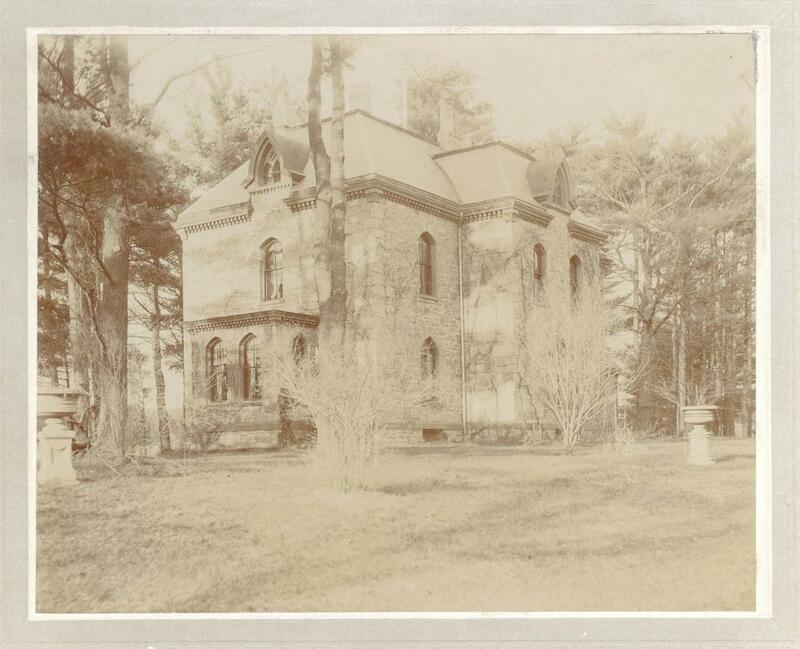 West of my house was an unbroken range of forest trees ; on the northerly side, in West Roxbury, were three farms. My nearest visiting neighbor was two and a half or three miles distant ; I was almost literally surrounded by woods, and my friends in Boston were much surprised at my going to such a wild and lonely place. There was, however, the Boston & Providence Railroad, on which cars passed within half a mile of my residence, running three times a day each way, to and from Boston. In 1846 three farms, containing about 200 acres, and including what is now the most thickly settled and valuable part of Hyde Park, were purchased by three men, who proposed to build upon and occupy them. Two houses were erected, one the stone edifice, corner of Gordon Avenue and Austin Street, formerly known as the Lyman House, lately the residence of Charles A. White, and now owned and occupied by Col. John B. Bachelder, the Gettysburg historian ; the other was the old homestead of Gordon H. Nott, whose enterprise and liberality were largely contributory to the early growth of this town. These three individuals then sold the remainder of their purchase to the Hyde Park Land Company. This company made some improvements and disposed of some of its land, but little was accomplished by it before 1856. The portion of the town taken from Dedham was formerly known as ” The Lower Plains,” a title sufficiently descriptive of its topographical characteristics. Away back a large part of it was owned by one Damon, in memory of whom the schoolhouse now in that locality received its name. About 1850 it was named by its inhabitants Readville, in honor of Mr. Read, who was the principal owner of the cotton mill there. About this mill were some score of houses and tenements ; and farther away, but still within the district, were perhaps half a dozen other residences, among them the homestead of D. L. Davis and that of the late William Bullard, both on the Milton road, still occupied by the then owners or their descendants, and the handsome, and for those days, elegant French cottage of William S. Damrell, then member of Congress. This stood, with ample and pleasant grounds around it, on a low hill rising back from the pond caused by the mill-dam. It is now owned and occupied by E. A. Fiske. Mr. Damrell, as the only congressman ever resident upon soil now included in our town, claims more than a passing notice. He was an intense anti-slavery man, bold and fearless in the expression of his convictions, a warm friend and supporter of Sumner, Banks, Hale, and the other foremost champions of human liberty. He was of indomitable will, and resolutely attended to his public duties during the years immediately preceding the Rebellion, although so disabled by paralysis of the lower extremities, occasioned by lead poisoning, as to require the assistance of a person upon either side to move from place to place. In 1856, the time when these first manufacturing enterprises caused the growth and development of Hyde Park, Readville contained the bulk of the population within its limits. Fairmount was the spot selected for the experiment, and the credit of the first suggestion of, and of the greatest activity in pushing forward, the particular plan which led to the settlement there must be awarded to Alpheus P. Blake. He succeeded in getting a reasonable price fixed upon what he wanted, and then talked the matter up so well among his friends as to effect a formal organization of a number of them at a meeting held Sept. 1, 1855, at the residence of one of the members on Revere Street, Boston. Mr. Blake was made president of the company thus formed, and a committee was appointed to examine the locality suggested by him. 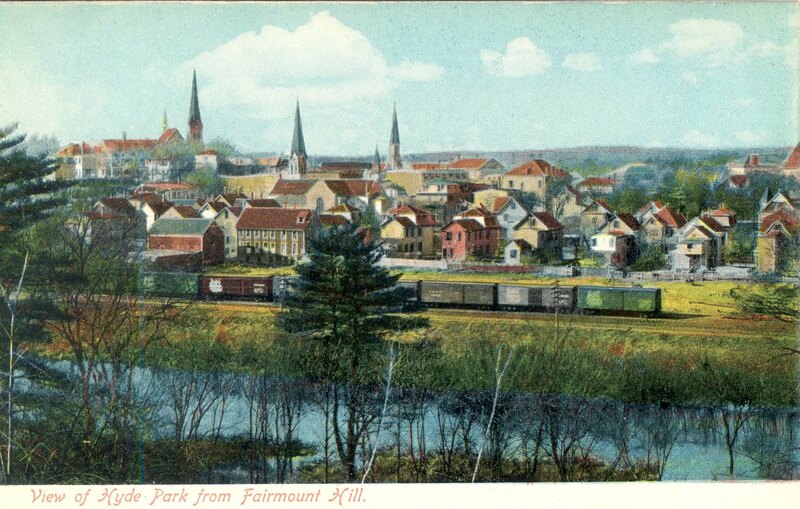 Although the Midland Railroad then occupied the location now of the New York & New England, it was bankrupt and not in operation ; so the investigating committee were obliged to go to Mattapan, on a branch of the Old Colony Railroad, and thence walk some two miles to their destination on Fairmount Hill. This experience, with the wild appearance of the country it was proposed to acquire and subjugate, so discouraged several of the committee that they in disgust abandoned both the place and the enterprise, and thus forfeited their chances of future glory and profit. 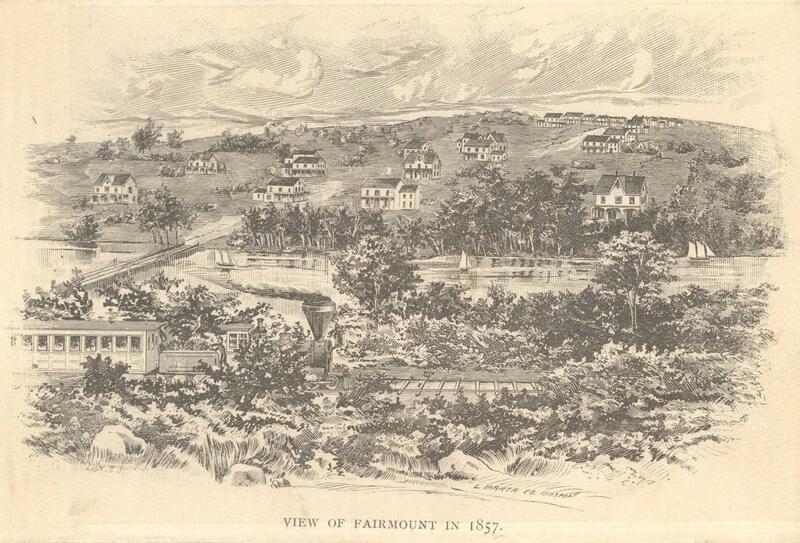 The remainder of the associates, however, to the number of twenty, ” stuck,” formed a trust company under the title of ” The Fairmount Land Company and Twenty Associates,” purchased one hundred acres off the back part of the farms of the dwellers upon the Brush Hill road in Milton, and on the 15th day of May, 1856, the first blow toward the erection of the first house in Fairmount was struck. This building is the one now standing on the corner of Beacon Street and Fairmount Avenue, at present occupied by G. H. Peare. 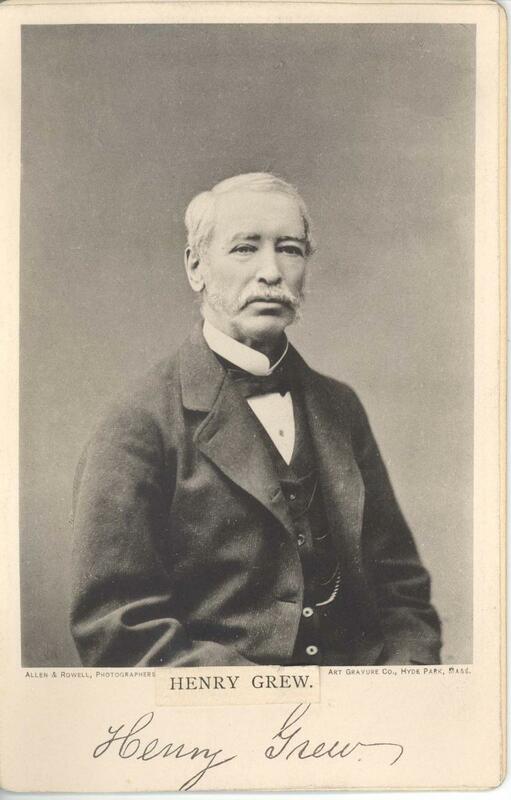 Henry A. 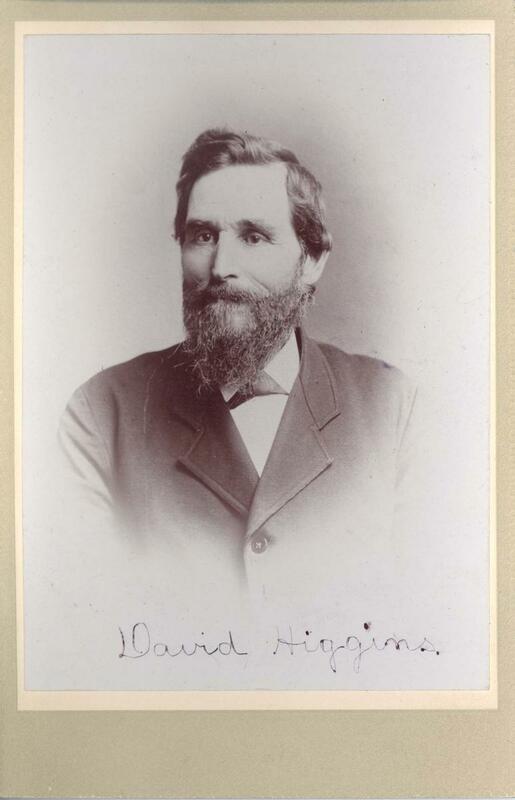 Rich, David Higgins, and William H. Nightingale were the first mechanics. The latter died some years since; the two former are still among the prominent residents of our town. It was the plan of the twenty associates that each should build and occupy a residence in the new territory. Most, if not all, of them did so, and three of them, Messrs. Fisk, Higgins, and Payson, still live in the houses then built by them. We present a copy of a wood-cut, originally printed in an illustrated paper of the date May 23, 1857. The association was made up of poor men, and great economy was necessary. The land was not fully paid for, the balance of the purchase price being secured by a ground mortgage. At one time the project was on the point of being abandoned, by reason of the many obstacles encountered, but the firmness of the late D. B. Rich prevented this. The pioneers had a hard time of it. The nearest point at which railroad accommodations could be obtained was on the Boston & Providence, at Kenny’s Bridge, and there but two trains each way per day stopped ; there was no depot, and to reach Fairmount from there it was necessary to cross the river in small boats, or on the stringers of the Midland Railroad bridge. The lumber and other material needed in the construction of their buildings was brought from Neponset by teams through Milton, and with much labor and difficulty transported up and over the crest of the hill. The mere preparation of roads, over which the material could be brought, was a work of no little amount on that rough hillside, then far more steep and uneven than now. The nearest store was at Mattapan ; the nearest post-offices at Milton and East Dedham. To accommodate the mechanics engaged upon the first houses, D. B. Rich opened a ” boardinghouse,” in an old building, where the seats were boxes and kegs, and the other accommodations of like ostentatious magnificence. But the settlers were resolute and full of resources. They endured what they could not remedy, and made use of every means attainable to better their condition. Before long, by joint contributions and efforts, they constructed a footbridge across the river. Finding the Midland Railroad there at hand, they resolved to utilize it, and did so, again combining their means and buying a car with an engine in one end, in which they journeyed in and out of Boston with great rejoicing, though they had for some time to dispense with a depot. In 1859 the Real Estate & Building Company was formed, and in 1861 incorporated. Under its efforts, and the enterprise of many individuals, the growth of the place was fairly progressing, when the Civil War came, upsetting the plans of so many, and, by the doubt and uncertainty it engendered, paralyzing to a great extent all enterprises. The most strenuous efforts were made by the company and others interested to overcome this incubus. That these efforts were only moderately successful is apparent in the admission made by the building company in its prospectus of 1864, that during the mighty struggle of the nation for its existence special expenses for the purpose of carrying on its enterprises had been mainly suspended by the company. Yet the growth of the town was not wholly arrested during this time, for we learn from a contemporary paper that in 1862 there were one hundred and fifty dwellings in the district between Brush Hill road and the Boston & Providence Railroad station at Hyde Park, which number had increased to two hundred in 1865. The end of the war, however, was the beginning of an era of truly wonderful activity and progress in this place, and for the next seven years it advanced at a marvelous pace. New lands in large quantities were acquired by the building companies and by individuals, platted, sold, built upon, and occupied with almost incredible rapidity. In the year 1867, not less than one hundred and six dwelling-houses were erected, to say nothing of buildings for business and other purposes. The price of lots trebled and quadrupled in value in a few weeks, sometimes in a few months increased twenty-fold. The growth of the place from 1865 was largely due to its natural attractiveness, which was now made to appear through the exertions of its public-spirited citizens. Through their efforts the establishment of manufacturing and other business interests of great importance was effected, social and moral needs were well provided for, and the unrivalled railroad possibilities developed. Local trains were multiplied on both railways, and additional stopping places secured. When the railroad managers doubted the expediency of establishing a new station and erecting a depot at any required point, enough citizens were forthcoming to furnish means to build a station-house at the place desired, and lease or give it to the railroad, on the condition of adequate train accommodation. So great was the demand for mechanics at this time that the most indifferent workmen demanded exorbitant wages. This and other inducements held out attracted to the town a not inconsiderable number of equivocal characters, and, as the credit system was largely in practice, many a confiding trader was sadly victimized. But such experiences are common to all new and rapidly growing places, and under this froth of irresponsible adventurers, was an able body of earnest, energetic, industrious, laborious, wide-a- wake men, whose faith in Hyde Park was as firm as adamant, and who plied every instrumentality without cessation, tending to promote its prosperity. So well did they succeed that in 1867 they were in a condition to ask for incorporation. 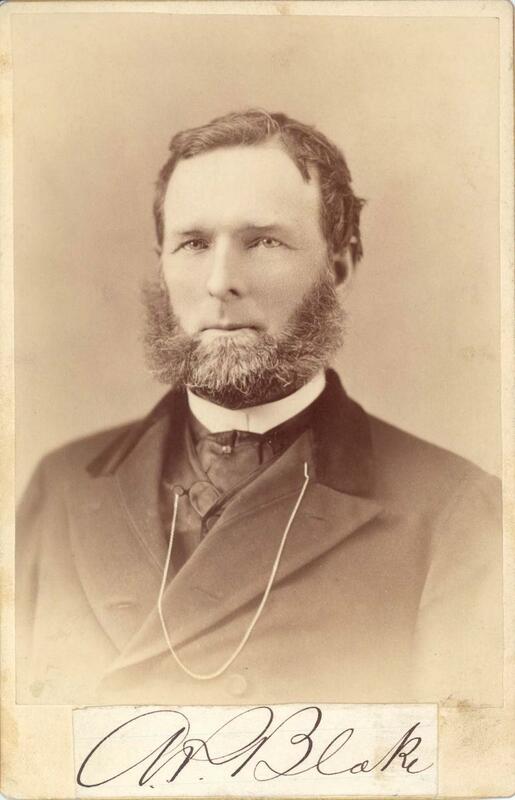 The first meeting looking to that end was called at Music Hall, on October 14th in that year, at which E. P. Davis was chosen to preside, and S. A. Bradbury and Charles A. Jordan as secretaries. A committee was appointed to consider the advisability of forming a new town, and the meeting adjourned to the 22d of the same month, at which the committee reported in favor of the proposed action, describing the district desirable to include. Almost all the residents conspicuous for their interest in the place were warm advocates of the measure. A formal petition to the General Court for incorporation of the district suggested in the committee’s report was duly filed. As illustrative of the transitory nature of the residents of new places, it is interesting to note that of the sixteen men whose names are appended to this original petition but five are now among our inhabitants. The request for incorporation was variously viewed by the towns whose territory was affected. Dorchester made no opposition ; Dedham refused to yield so much as was asked for, and succeeded in keeping a portion of it. 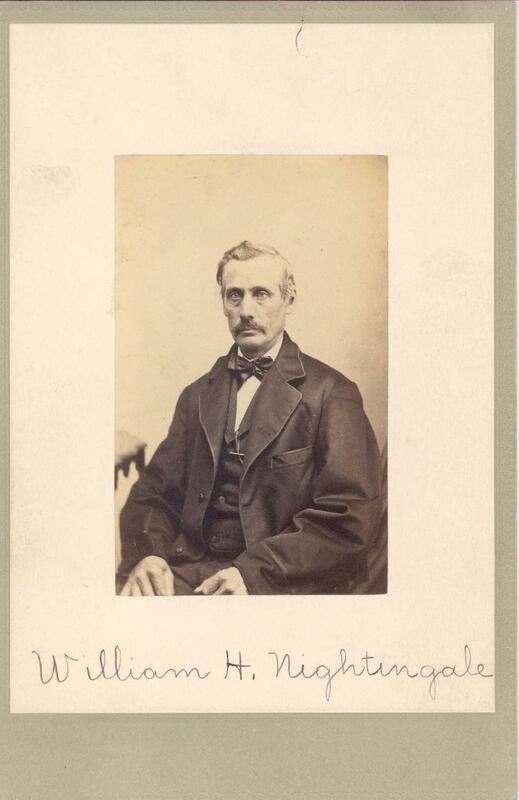 Milton also objected strenuously, the contest here finally narrowing down to the question whether the petitioners should have the southeasterly line of their proposed town established as petitioned for, so as to include a portion of the Brush Hill road and some twenty-seven families resident thereon, or whether the line should run along the crest of Fairmount Heights, several hundred feet northwesterly from said road, and leaving the above-mentioned families to remain within Milton’s limits. Over this the fight waxed hot and furious. In the legislative committee-room frequent hearings were had during a period of five or six weeks, which resulted at last in a report to the Legislature recommending a compromise line, giving the petitioners less than they asked, but more than the Brush Hill residents were willing to concede. 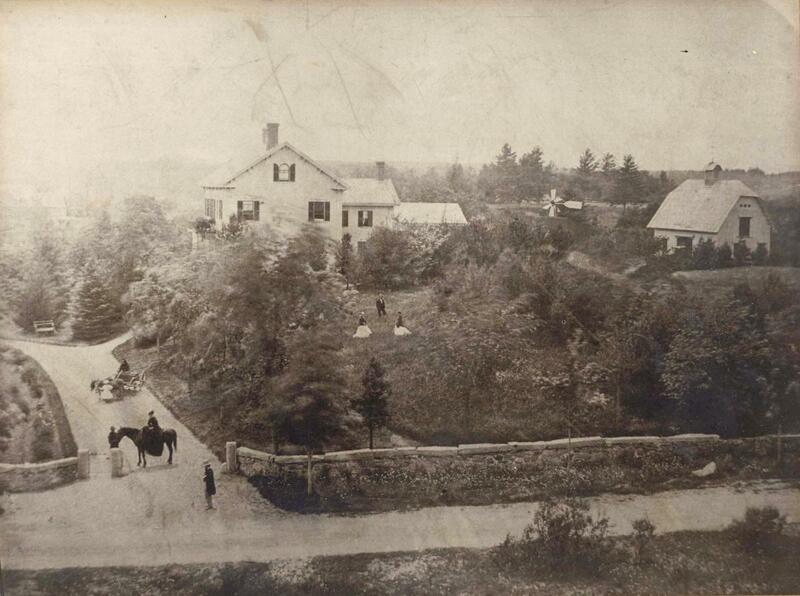 The outcome of all this heated controversy was that the act of incorporation of the town of Hyde Park, passed and approved April 22, 1868, took about thirteen hundred acres from Dorchester, eight hundred from Dedham, and seven hundred from Milton, and left the old residents along the Brush Hill road still within the boundaries of Milton, and presumably happy. The new town promptly organized on the 30th day of the same month, Maj. William Rogers, formerly of Governor Andrew’s staff, being chosen moderator of the first town-meeting. The recipients of municipal honors were not elected without vigorous opposition. Hyde Park esteems the places in its gift too highly to bestow them easily. There were no less than five tickets in the field ; the regular caucus nominations being the successful ones. The custom thus inaugurated of lively competition for town offices has ever since been honored with implicit observance. A section of Capt. Baxter’s Light Battery was present, and hailed the birth of the new town with a salute of one hundred guns. The citizens made a holiday of the occasion, and celebrated the event with rejoicings, and plentiful displays of fireworks in the evening. A fine rainbow at sunset was accepted as a propitious omen, significant of the future lustre of the town.